Decorative Life: Examples include G. wickhamii lasting only 3 days while G. whiteana lasted 9 days. 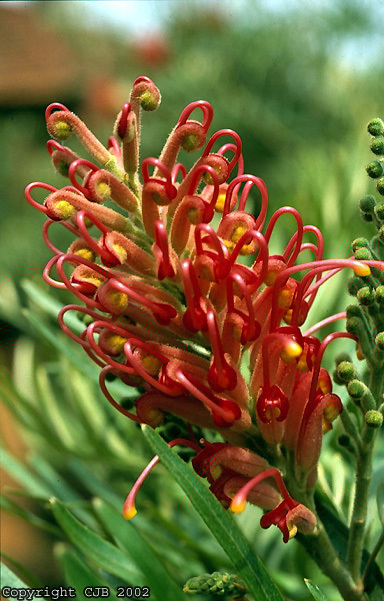 Species with relatively good vaselife include G. pteridifolia, G. sessils, G. banksii and G. whiteana. Harvest when about 20% of the florets are open is one recommendation whic another is to harvest when 10-70% of the individual flowers have styles protruding out of the heads. Can be stored for 3-9 days depending on species. Best stored at 32-34F for up to 12 days as storing at higher temperatures can greatly reduce subsequent vaselife. Wet and dry storage gave similar results. As is surprising with many protea type flowers, this species is not chill sensitive. Has been shown to cause dermatitis related problems with some individuals. Named for Charles F. Greville (1749-1809), a founder of the Royal Horticultural Society and once its Vice President. Often grown for its nectar-rich flowers to attract birds to garden settings or for its attractive foliage. Poorinda Hybrids represent a large group of plants derived from numerous crosses of a number of species.